In some jobs, people get their hands dirty. Lots of Zinfandels, so few punchlines. 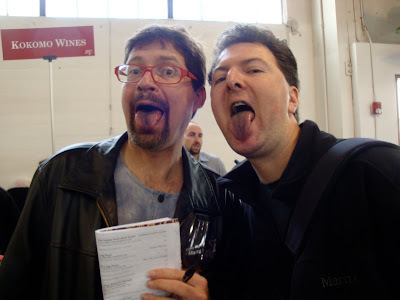 Tasting notes to come, but I will say right now there's a very good reason we're standing in front of the Kokomo Wines booth at ZAP with our tongues hanging out. front of the Kokomo Wines booth at ZAP with our tongues hanging out. " Is that what the two of you are doing? I thought you were expressing your views of Fox News. My mistake. King: No, we don't have our fingers down our throats. Nice try though.